We really like the Pixelbook, but starting at $1,000, it ain’t cheap. If Google is planning on make a more affordable 2-in-1 Chrome OS machine, consider us interested. Thanks to the seemingly endless number of Pixel 3 leaks, we’ve got a pretty good idea of the kind of phones Google will probably launch on October 9. However, info on other product announcements scheduled for Google Day are still a little sparse, which is why these pics that appear to show Google’s new Chrome OS tablet are so interesting. Discovered by About Chromebooks, the tablet, which has been dubbed the Pixelbook Tablet, would be Google’s first homegrown tablet since the Pixel C from back in 2015. Based on the pictures, it seems Google’s upcoming tablet is actually more of a 2-in-1, except instead of using a complicated magnetic kickstand for attaching the keyboard like on the Pixel C, the Pixelbook Tablet may use a more traditional hinge with little tabs on either side for connecting its two separate parts. Based on the pictures, it’s unclear if the Pixelbook Tablet would use Bluetooth or pogo pins to communicate with its keyboard. 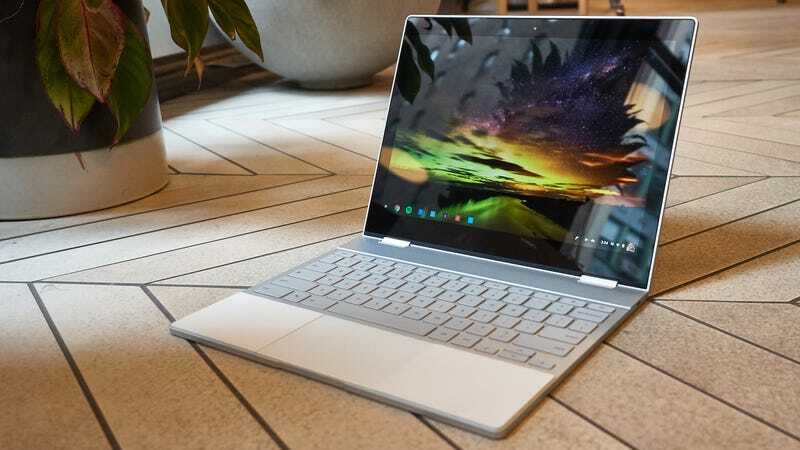 However, if this device is actually one of Google’s rumored Pixelbook 2 devices, which have been going by the codename “Nocturne,” it should have a physical connector for attaching the keyboard. Another small tidbit that suggests this PixelBook Tablet is related to Nocturne is the small indent on the top left corner of the tablet’s screen, which looks to be a combined fingerprint sensor and power button. Unsurprisingly, with Google’s big push to make USB-C more widely accepted, the leaked tablet looks to have one headphone jack along with USB-C ports on either side of the display, but no USB Type-A. That means you might need a dongle if you want to hook up older accessories. We don’t know how much this thing might cost, but if this tablet can fill the gap beneath the $1,000 Pixelbook (or whatever ends up replacing the Pixelbook), we could be looking at a pretty nice, mid-range Chromebook to compete with systems like Samsung’s Chromebook Plus V2, which is currently one of our favorite Chrome OS laptops on the market.